The Middle School girls' soccer team started its season on a high note as the girls won their first game of the year 3-0 over Morristown-Beard School. Sixth-grade goalkeeper Sophie Elber was fantastic between the posts as she recorded 11 saves for the shutout. Eighth-grader Delaney Yates led the offense, scoring two goals and recording an assist. Also helping on offense was fellow eighth-grader Lauren Rossiter who scored a goal and recorded an assist. 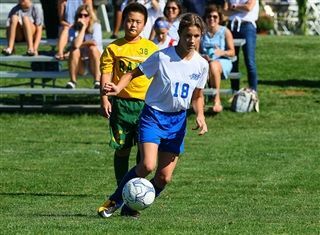 Eighth-grade midfielder Grace Crimi and seventh-grade sweeper Talia Licata controlled the middle of the field to help preserve the win.